The line for Bill Nye extended to the amphitheater, as hundreds of students gathered to see the beloved science guy on Feb. 19. 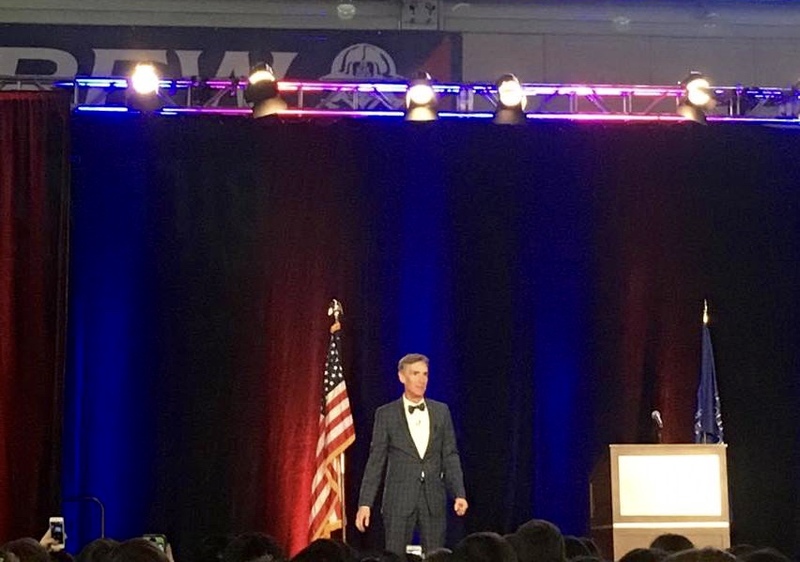 While American University students are known for caring mostly about politics, the excitement surrounding Bill Nye’s announcement demonstrated an appreciation for the sciences. As the line finally diminished and lingering students hustled to their seats in Bender Arena, Nye took the stage while loud chants of “Bill Bill Bill!” resonated through the crowd. During his speech, the scientist and television personality connected climate change, space exploration and his personal history. He further highlighted the unbridled potential for Millennials to “change the world!” Nye repeated this catch phrase throughout his speech, reassuring students of the impact they can have. Along with a few phallic jokes about sundials and the Washington Monument, Nye delivered copious laughs, knowledge and inspiration. His penchant for doing so is what lead to his success as host of Bill Nye the Science Guy. But, for a scientist, his speech was surprisingly political. As Nye pointed out, it’s difficult to separate science from politics in a country where millions deny climate change and evolution. Nye paralleled the growing human population and the effects of climate change. During childhood, Nye attended the 1964 World’s Fair in New York City, where a digital sign tracked the number of humans on Earth. Nye missed the human population change from 2.99 billion to three billion people by a matter of hours. “Now, as of this afternoon, I got on the electric Internet and the world’s population is about 7.3 billion people,” Nye said. The human population more than doubled in Nye’s lifetime and continues to rise. According to Nye, the booming population is directly accelerating climate change. Nye didn’t shy away from vehement criticism of climate change deniers. He condemned the nation’s addiction to fossil fuels and the million-dollar industry of climate change denial. The scientist specifically mentioned Republican Sen. Jim Inhofe, who infamously threw a snowball in the congressional chamber to refute global warming. He further chastised Florida Gov. Rick Scott for banning his cabinet from uttering the words “climate change” in public. Nye also drew on the economic advantages of sustainability. While many lawmakers reject alternative energies, not wanting to disinvest in and destroy jobs that depend upon the fossil fuel industry, Nye pointed to how states like Kentucky will benefit from going green. In Kentucky, twenty thousand jobs currently depend upon the coal mining industry. If the nation switches to alternative energies, approximately 142,000 construction jobs and 47,000 operational jobs will be created in that state alone. His political criticisms did not end there. Nye went on to sarcastically praise the Department of Defense, suggesting its former name, the Department of War, was more fitting. “That’s our business. War. Unless we ‘defend’ our oil overseas…” Nye said. Nye’s criticisms of US dependence on foreign oil were apparent – war is costly, fiscally and environmentally speaking. Apart from politics, Nye delved into his family history. During WWII, his mother worked on the famed Enigma Code and his father was a Prisoner of War for four years. While detained in Japan, his father grew fascinated by the night sky and developed an affinity for sundials, which Nye inherited. Nye himself crafted sundials from beer cases and a pizza box and was instrumental in positioning sundials on Mars. There, he discovered different hues of the Martian atmosphere through the dial’s shadows. Nye made up new words to describe various colorful phenomena, such as zanthadesence and orangidescence. Nye stressed that these groundbreaking scientific discoveries, including evidence of life on other planets, continually change how we conceptualize our place in the universe. As the head of the Planetary Society, he emphasized the importance of continued space exploration, despite a desperate need to focus on our own planet’s issues. To further inspire and emphasize students’ own capabilities, Nye spoke of his grandfather, who as a chemist in WWI, placed gas masks on both himself and his horse. By the time WWII occurred, the horse-sized gas mask was obsolete because there were no more horses on the battlefield. Everything changed in the twenty-years between wars, or as Nye referred to it, “the extended dance mix of conflict, when WWI became WWII.” According to Nye, his grandfather’s generation revamped the very fabric of their society out of necessity, and Millennials can follow in their ancestor’s footsteps to save the planet.